Anne Healy Ayella, an assistant director of the Archdiocese of Philadelphia’s Nutritional Development Services (NDS) is also the archdiocesan director for Catholic Relief Services. 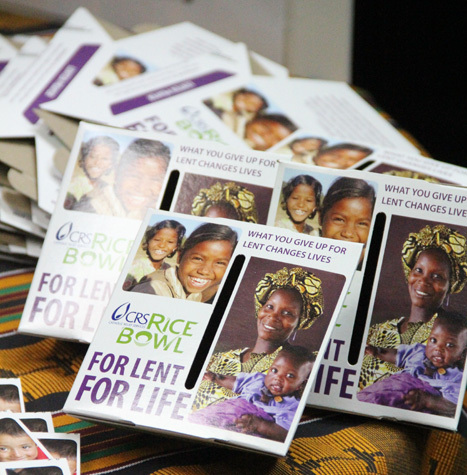 CRS is the sponsor of the annual Lenten program CRS Rice Bowl, which focuses on the alleviation of world hunger. CRS Rice Bowl traces back to 1975 when it was founded as an interfaith program by Allentown’s Msgr. Robert Coll. The following year he suggested to Cardinal John Krol that it could be adopted by the 41st International Eucharistic Congress which was held in Philadelphia in 1976 with the theme, “The Hungers of the Human Family.” The Congress did adopt it and the next year the American Catholic bishops authorized it as an annual drive under the auspices of CRS. Last year the title was officially changed to “CRS Rice Bowl.” At this point, the program raises in excess of $6.5 million to help fund CRS relief efforts around the world. Anne and her husband, Fred Ayella, reside in Annunciation B.V.M. Parish in Havertown and are the parents of three children. 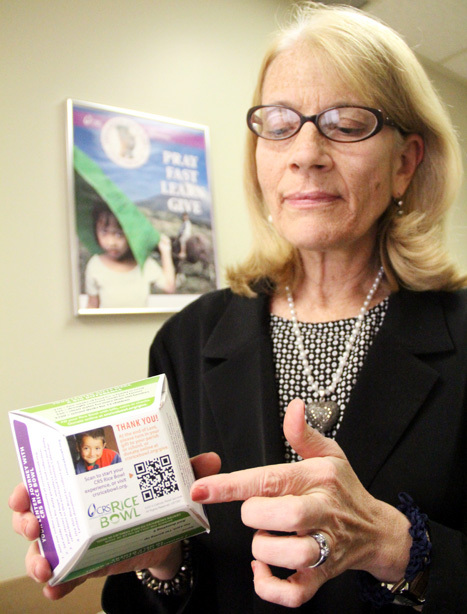 She has overseen the archdiocesan Rice Bowl program virtually from the beginning. Q. How did you become involved with what was then Operation Rice Bowl? A. In 1976, when Sister Mary Scullion and I were seniors at St. Joseph’s University and involved in a big way with the Faith Justice Institute that was started by Father Ed Brady. Maureen McCullough (currently Mid-Atlantic Regional Director of CRS) had just graduated from Immaculata and was working with Father Brady. We all worked with the Eucharistic Congress. After graduation I worked for St. Joseph’s for three years then went to the archdiocese at the Cardinal’s Commission for Human Relations (CCHR). When I started working there the Community Food Program was under CCHR. The next year Patrick Temple-West, the founding director of NDS, suggested the program really ought to be part of NDS. It made sense for fundraising, so I moved to NDS. Q. What is the mission of CRS Rice Bowl? A. CRS Rice Bowl has all of the components of Lent. It is about praying, fasting, learning about people around the world and giving. It is not just a collection. You are really getting to know people, hearing their story, praying for them and giving. Q. How does the Rice Bowl program work? A. Once a week, usually on Friday, a family prepares a very simple meal and deposits the savings from the meal into the cardboard family rice bowl provided. The rice bowl has very good information printed on it — a prayer, something about the project and there is a new (mobile) app that can be accessed. Q. How much money is raised by Rice Bowl in the Philadelphia Archdiocese? A. Last year we raised $400,000 of which $100,000 stayed in the archdiocese with NDS and $300,000 was sent to CRS. Q. How do you use the NDS share? A. We purchase food for area food cupboards and soup kitchens. Three times a year we will purchase a big order, basically at times we know food donations will be down. Every diocese involved uses their share in different ways. Q. How does CRS use its share of the funds? A. They use it around the world. There are usually focus countries each year. This year it is Kenya and Malawi in Africa; Guatemala in Central America and also Haiti and the Philippines. In the Philippines it will be for rebuilding from the typhoons of 2012 and 2013. In Guatemala the funds will be used for education programs; in Kenya for job creation; in Malawi for agriculture programs and in Haiti for a health program. Q. Programs like this, although very commendable, can become stale over time. How do you keep it fresh? A. I think changing the focus countries helps. People get to see a variety of programs and get to know people in different parts of the world. Most appealing to people is the new app that can be scanned from the bottom of the bowl. You can scan it or go online for the same information. It is appealing to all age groups; that is the beauty of it. You really get to hear the stories of the people and every week is a different story. I think this appeals to families and kids. It is not just saying a prayer and putting money in a bowl. There is always something from Catholic social teaching to make it come alive. Q. Locally what is new? A. St. Charles Seminary is coming on board in a big way this year, and on April 9 we will have an international speaker at St. Charles. He is Thomas Awiapo from Ghana who tells how CRS basically saved his life. He was a little orphan boy when CRS came into his village and built a school and provided meals for the children. He goes everywhere telling his story especially to kids. Q How can the website be accessed if you can’t use the app?